1) The personal application of great truths was very profound in this book. I noticed this from the way CJ would take a basic point – say, an attribute of God – and apply it to himself over and over, showing how much could be gleaned from it. This was a great reminder that the goal of doing theology is not merely to think new thoughts and acquire new knowledge – the goal is also to sit in the knowledge we already have and let it sink more deeply into our hearts. We should seek breadth in, as well as depth of, theological knowledge. Already within the basic truths of the gospel – the majesty of God, the ugliness of sin, the wonder of cross – are the resources we need for much spiritual victory. There is so much breakthrough already stored up in a fresh discovery of these truths we already believe – if we would apply them to ourselves with a humble heart. 2) I appreciated C.J.’s reminder of how crucial the cultivation of humility is in our Christian life. C.J. says (quoting John Stott) that at every state in our Christian walk, humility is our greatest friend and pride is our greatest enemy (29). C.J. reminded me of how incredibly serious a sin pride is – contending with God Himself by robbing Him of the glory that is His due (31-32). What a rebuke to shallow, calm thoughts of sin! Conversely, C.J. showed how just as God is repelled by pride, He is decisively drawn to humility (20). This is powerful motivation. Its easier to see the importance of humility when you remember that it makes the difference between life and death, between the favor or opposition of God himself. CJ showed that no matter where we are, what we are going through, how long we have already been Christians – humility is always the key ingredient for moving forward in God’s sight and kingdom. 3) Through this book I came to a deeper understanding of the nature of pride – how hateful it is to God, unhelpful it is to us, and irrational it is in itself. C.J.’s comment that pride is not only the first and greatest sin, but the core of all sin (30), helps explain why it has such a big impact on our lives. One specific way I saw pride in my life through this book is worrying. I often think of pride manifesting itself in condescension or boasting, but I had not considered as much until I read this book how pride can manifest itself in worrying and anxiety (75). When I feel anxiety, I wonder how much of it stems from a failure to walk in child-like trust with the Lord, who owns my life and knows the number of hairs on my head. Repenting of pride in this specific manifestation of it was refreshing and life-giving. Anxiety is so unpleasant, and casting it on the Lord (I Peter 5:7) is like taking a burden off. 4) I appreciated the way C.J. defined humility theologically, in terms of God’s holiness and our sinfulness (22, 58). So often we think of humility purely in horizontal ways (interacting with other people) and not enough in vertical ways (our relationship to God Himself). So often we are more concerned with appearances than reality, and our attempts to be humble are really just attempts to appear humble before others. I am grateful for C.J.’s reminder that our incentive for humility should be the favor of God, not people (cf. Isaiah 66:2: “this is the one to whom I will look: he who is humble and contrite”). Only when we see that humility is something that happens before God Himself are we liberated to stop pursuing the mere appearance of humility. 5) I appreciated the way C.J. showed the need for intentionality and purposeful, specific effort against pride (and other sin) in our sanctification. By reading this book I realized that I sometimes avoid talking about humility out of a fear of being perceived as proud (or even becoming proud in the way I talk about it). I fear that if I focus too much on humility, that very focus will sound like, or become, inordinate self-focus (pride). I therefore adopt a kind of laissez-faire approach to humility – just worship God and love people, and it will happen by itself. This book exposed this attitude and helped correct my understanding of sanctification. While we are obviously never aware of all the ways God is working to change our hearts, there is a place for intentionally fighting against specific sins, through the power of the Holy Spirit (Romans 8:13). 6) CJ shows that not all ambition is pride, and helps us see the difference between good and bad ambition. In dealing with the disciples’ request in Mark 10, C.J. helpfully points out that Jesus does not rebuke the disciples for their ambition to be great, but rather redefines greatness as “serving others for the glory of God” (44). Serving others for the glory of God – that is what true greatness is. Yikes! Very convicting. C.J. leaves us with the hope of the gospel, however, that if Christ died for us when we were still sinners (Romans 5:8), then there is room to repent and keep seeking after humility even when we feel so far from it. If God called us when we were dead in our sins, he will certainly not give up on us during the more sobering moments in sanctification. Christ died for me when my pride was my master. He will not give up on me now that it is my enemy – however fierce it may seem. 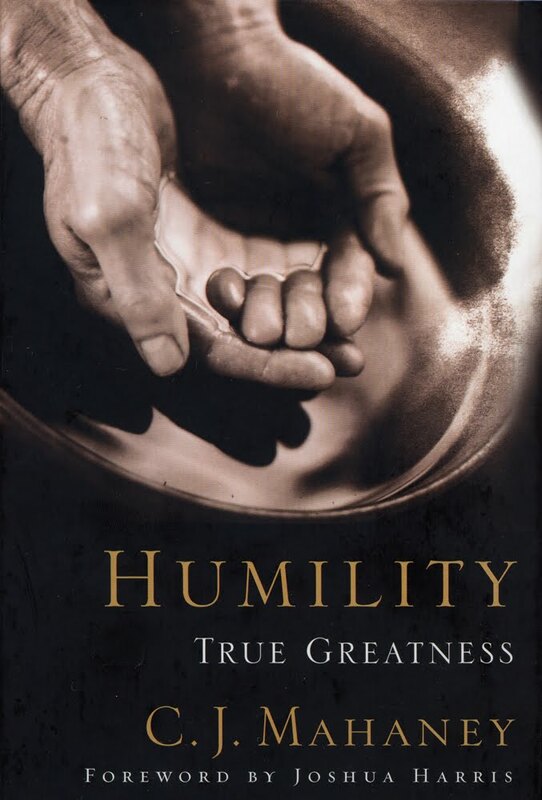 7) The practical suggestions in section 3 of this book (“The Practice of Humility”) were very helpful. I appreciated the way he discussed both theological considerations, such as reflecting on the incommunicable attributes of God (88), as well as some of the more mundane aspects of life, such as laughter (94) and sleep (83). I also appreciated his suggestions to notice evidences of God’s grace in others (chapter 8), and to invite and pursue correction (chapter 10) from others. As I read his comments about how this applies to our families on 106-107, I asked myself the question: “do I notice evidences of God’s grace in Esther more frequently than I am critical?” Yikes! Another gulp, and prayer of repentance. 8) I appreciated the way CJ consistently discussed humility, and our pursuit of it, in terms of the cross of Christ. Putting humility in this light is very clarifying and very … well … humbling. Considering the infinite price that my sin cost Christ in putting him on the cross makes me feel very low, but also very loved. It strips me of any possible reason I might have left for pride, since my sin put him there. But it leaves me with dignity, since One so great has stooped so low to love me. The cross creates a new kind of self-worth – one that comes from outside me, totally apart from anything I have done, and yet intensely personal. The cross teaches me who I am, deeply sinful and yet deeply loved, in a way that nothing else can. It creates a new kind of dignity and worth that I would not have grasped anywhere else. It teaches me a new way to live. From reading this book I have a better understanding of how terrible my pride is, how worthy of pursuit humility is, and but how amazing the love of Christ displayed in the cross is to me. Thank you, CJ. Sounds great Gavin! I liked what you pointed out about worry–because if we really believe that God holds us in His hands and guides our every step, why worry? I think my worry indicates my thinking that my future is in my hands. They tell another side. Hope this helps. Steve, I’ve seen those websites before. They have zero credibility to me whatsoever, because of my personal acquaintance with SG, and because of the very nature of a ranting site. Surely you have a better way to spend your time.